Benedict Drew, The Trickle-Down Syndrome, 2017, mixed media, dimensions variable. In his current exhibition, Benedict Drew visualizes the effects of a fallacious economic theory that favors the rich and powerful over the poor. His massive installation The Trickle-Down Syndrome, 2017, forms a network of five interconnecting spaces that pulse through the ground floor of the gallery like an uncontrollable nervous system. 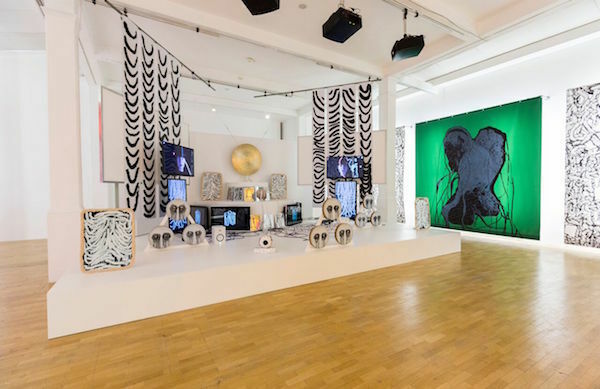 The activity seems to feed into the central room, which features throbbing video imagery, handcrafted objects, a distorted sound track, and large, cascading vinyl banners. The space is governed by a raised platform much like a stage, which presents a nearly symmetrical tableau. Despite the balanced arrangement, the visual effect is anarchic: Screens that mirror each other display actress Gretchen Egolf musing over sundry environmental and sociopolitical issues. Her hushed, disjointed ruminations are virtually indecipherable amid the din. Sets of drums are painted with staring, sinister eyes—above one grouping, a large cymbal hangs. The instruments reverberate along with the accompanying audio, which buzzes with anxiety. In another room, two large fans are activated in twenty-minute intervals, sending stacks of newspapers, created by the artist, fluttering. The word “SLUSH” is printed on the front page, while inside, the artist’s digitally manipulated drawings seem to report on disorder and dismay. A wall projection displays the text “THAT SINKING FEELING,” and a video monitor nearby shows two legs feebly attempting to navigate muddy terrain. We become afflicted by the monstrous syndrome—we feel overwhelmed. Drew’s tumultuous presentation indeed provokes despondency, yet is simultaneously somehow exhilarating: a dystopian dreamscape, dripping with existential dread.